Yet another marine mammal has died at SeaWorld. 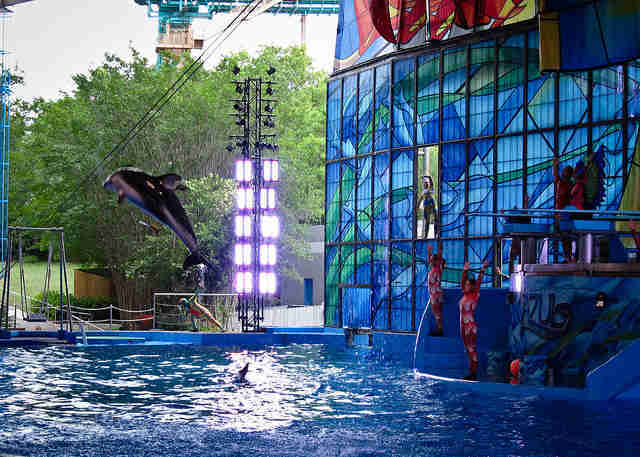 The entertainment park announced on Saturday that Dart, a 12-year-old Pacific white-sided dolphin, had passed away at SeaWorld San Antonio. He was the fifth known marine mammal to pass away at a SeaWorld park in the past eight months. While the cause of Dart's death is not yet known, SeaWorld said he had been under veterinary care for "health-related issues." 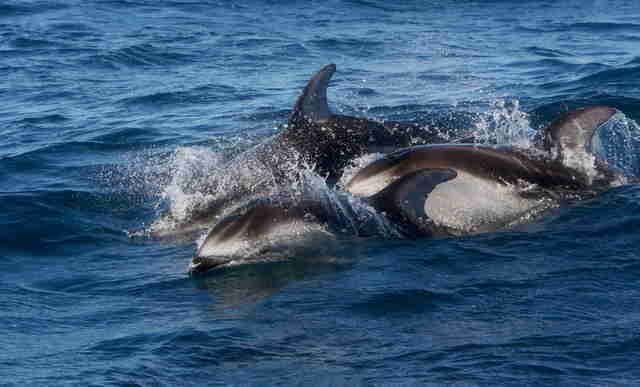 Pacific white-sided dolphins usually live to be roughly 36 to 40 years old. SeaWorld also said that one of Dart's companions, Betty, a 37-year-old wild-caught Pacific white-sided dolphin and the oldest of the park, was under "24-hour veterinary care for indications of inflammation or a possible infection." 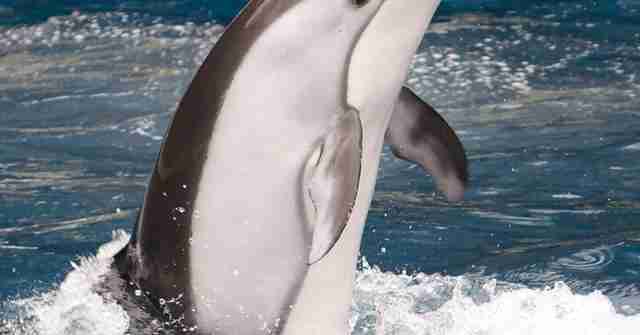 SeaWorld's treatment of its dolphins has previously come under scrutiny. Back in August, Dr. Heather Rally, a marine mammal veterinarian who works with PETA, witnessed what looked like infectious lesions on the back of SeaWorld Orlando's bottlenose dolphins, who are kept in an area where visitors can pet and interact with them. "They were consistent with an infectious origin ... they weren't normal," she said at the time. "Not only are these dolphins likely to be stressed and therefore immunocompromised, they're also being exposed to a much larger amount of bacteria [than wild dolphins are] because they're being exposed to people who haven't washed their hands." The Pacific white-sided dolphins appear to live at Beluga Stadium, where they perform in the Azul animal show with the belugas and a number of captive exotic birds, and do not appear to have direct contact with the public. However, the public is able to swim with the belugas and share "touch, hugs and kisses" with them. Of course, captivity in general can lower animals' resistance to infections and other diseases - and Dart is just the latest in a string of deaths at SeaWorld. He is at least the fourth marine mammal to die at the San Antonio location since July, though the park said "there are no apparent connections between these deaths." In December, an 18-year-old orca named Unna died at SeaWorld San Antonio after a months-long battle with candida, a fungus infection that is common in captivity. SeaWorld later said she had died as a result of a "systemic bacterial infection" that she was battling at the same time as the fungal infection, but the full necropsy was not released. Female orcas in the wild live around 50 years on average, and can live to be 100. In November, a 2-year-old beluga calf named Stella passed away at San Antonio. In July, another unnamed 3-week-old beluga calf died. The cause of death for both of them is still unknown, though when the first calf died Naomi Rose, a marine mammal scientist with the Animal Welfare Institute, told The Dodo that she suspected captivity was partially to blame. "Given that the facilities have corporate reasons for insisting captivity has nothing to do with these deaths and refuse to conduct the necessary, objective science to truly understand mortality risk for captive-born calves, I am left to speculate that yes, captivity had something to do with this calf's death," she said. And it's not just San Antonio. A mature Commerson's dolphin named Betsy passed away at SeaWorld Orlando last month after an ill-advised move across the country, the latest in a long string of disasters for SeaWorld's stock of captive Commerson's. The deaths are just the tip of the iceberg when it comes to SeaWorld's animal mistreatment, though that's little consolation for Dart, who spent all of his short life cooped up in a small tank. In a statement, SeaWorld said Dart was "high-energy, extremely playful, [and] enjoyed participating in shows."